The Community Affairs Unit is responsible for informing the citizens of crime prevention methods to help avoid, prevent or minimize personal injury and /or loss of property resulting in criminal activity; and to reduce crime and the perception of crime in the community through target programs like Neighborhood / Crime Watch Programs. Though the responsibility for achieving the agency's community relations objectives is shared by all Sheriff's Office personnel, the Community Affairs Unit supports the efforts of community policing programs which provides educational solutions and directions through the interpretation and explanation of the provision of laws, rules and regulations as needed to combat specific crimes as well as to educate the public. While committed to providing quality law enforcement services to the citizens of Charleston County, the Community Affairs Unit will establish and maintain contact with the Sheriff's Office staff, other law enforcement personnel and government agencies regarding community issues. Charleston County Sheriff's Office is totally committed to the task of reducing crime and providing a safer and better quality of life for our citizens. Through the Crime Watch Program for the citizens and community groups, selected proactive participation is necessary to reduce the opportunity and desire of potential offenders to commit crimes. This community based crime prevention program is a simple and direct approach toward protecting our community from criminal attacks. Crime problems in our nation is both costly and demoralizing. Directly and Indirectly, we are all affected by crime that has caused injury and financial loss. These type situations demonstrates a need for community involvement and assistance in crime prevention and reporting by participating in your NEIGHBORHOOD WATCH PROGRAM. The Charleston County Sheriff's Office stands ready to assist and support your program. The National Sheriff's Association created the National NEIGHBORHOOD WATCH Program in 1972 to unite law enforcement, the community and its' citizens in an effort to reduce crime. Whatever the name, when neighbors organize to help local law enforcement with the community, it can make a significant impact on reducing crime and fear in the area for our children and citizens. Determine if you have enough community interest. Contact the Charleston County Sheriff's Office Community Affairs Unit to advise them of your interest to organize a Crime Watch Program. This agency does not finance the signs or neighborhood credentials - Some Neighborhoods chose to connect through social media platforms such as facebook or nextdoor. 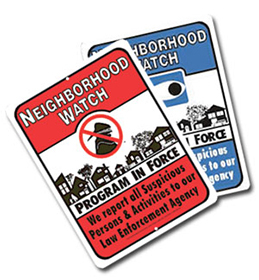 Use these Flyers or Brochures as an easy way to notify your neighbors of your new Neighborhood Watch Program. Click the links below to view and print each Flyer or Brochure. The Charleston County Sheriff's Office offers the Project Lifesaver program for citizens of Charleston County. This program is designed to aid in locating wandering or lost individuals with Alzheimer's, Autism, Down syndrome, Dementia or other cognitive conditions. This program is provided at no cost for approved individuals and their families. For more information, please contact Senior Sergeant Harold Phillips for more details. The Selective Traffic Enforcement Unit receives hundreds of traffic complaints each year, and as a result of the high volume of complaints we receive from citizens regarding issues in their neighborhoods, we conduct focused enforcement in certain neighborhoods. We frequently rotate our enforcement to other areas. We encourage you and your neighbors to submit your request for enforcement to your Community Liaison Representative for your area. When the animal's owner cannot be located, the Animal Control deputies who are trained to handle these situations involving domestic animals will remove any stray domestic animals that are unleashed in or near roadways. This unit will transport injured domestic animals to the emergency veterinarian for treatment and conduct the necessary investigations relating to neglected or abused animals. During Hurricane Season you can shelter your pet by clicking on any of the below links for additional information. Magistrate Courts handle a variety of issues, including restraining orders, traffic violations and criminal cases with punishments of a fine not exceeding $500 plus assessments or imprisonment not exceeding 30 days or both. These courts also handle landlord-tenant problems as well as claim and delivery civil actions and issuance of arrest and search warrants. The Summary Courts Administration provides administrative support to the Centralized Preliminary and Bond Hearing Courts as well as 10 area Magistrate Courts and two Small Claims Courts. In an effort to assist victims of and witnesses to crime, the Charleston County Sheriff's Office has established a Victim/Witness Assistance Program. This program offers valuable information and assistance to victims/witnesses concerning their rights under South Carolina Law. For more information call (843)745-2250 or click here. Most cases of elder abuse goes undetected. Elder abuse refers to intentional or neglectful acts by a caregiver or "trusted" individual that lead to, or may lead to, harm of a vulnerable person. Physical Abuse; Neglect; Emotional or Psychological Abuse; Verbal Abuse and Threats; Financial Abuse and Exploitation; Sexual Abuse and Abandonment are all considered forms of elder abuse. If you suspect an elderly person being neglected or abused report it immediately to your local law enforcement agency. Don't assume that someone has already reported the suspicious situation. You may also visit www.ncea.aoa.gov or call Eldercare Locator at 1-800-677-1116 for more information on elder abuse or neglect. Are you curious about the job of a Deputy Sheriff? Maybe you are interested in a law enforcement career? If so, then here is the opportunity you have been waiting for. To find out how you can ride with a deputy sheriff contact the Patrol Commander at (843)762-2007. On a local level, the S.C. Emergency Management Division sponsors training for representatives from each county to become certified to train individual CERT teams within their community. CERT teams can be comprised of neighbors, fellow employees within an industry, schools, church groups, civic organizations, etc. To qualify as a neighborhood team, at least three members from a designated area or organization need to participate in and complete the training program. Click here to read more about C.E.R.T. Do You Know Who Did The Crime? Important Message: Remember the Code sent back to your phone to claim your Reward if authorized. Thinking About Living In The Neighborhood?